Over the past three years, the Mountain Park Old Time Band has been creating a stir in old time music circles. The group has five members, all of whom are versatile and talented musicians. Johnny Gentry plays guitar, dobro, and fiddle as well as doing vocals for the band. Nancy Gentry plays upright bass and sings. The only thing better than one fiddler, is two fiddlers. Roger Stamper also plays the fiddle. C. T. Janney plays the washboard – an "instrument" rarely played today. Dr. Mark Handy plays banjo and does vocals. When he's not playing old time, Dr. Handy practices medicine in Abingdon, Virginia. 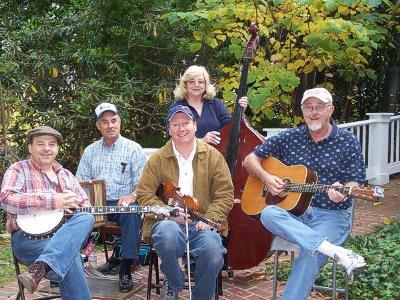 Saturday, October 22nd, 2011, at 7:30 p.m., the Carter Family Fold in Hiltons, Virginia, will present a concert by the Mountain Park Old Time Band. Admission to the concert is $7 for adults, children 6 to 11 $1, under age 6 free. The Mountain Park Old Time Band has played at the Blue Ridge Music Center, the Mountain Music Jamboree, and at Bristol's Rhythm and Roots Festival. They have also been featured on National Public Radio. The group has released two CDs – Fire on the Dance Floor and Dancing with Sally Goodin. Fans of groups like the Whiteop Mountain Band will love the Mountain Park Old Time Band. Be sure to bring your dancing shoes, and be ready for a night of down home fun. Nothing gets you out of your seat and on the dance floor faster than a rousing old time band. Don't miss the Mountain Park Old Time Band at the Carter Family Fold! For more information on the group, go to the band's web site.